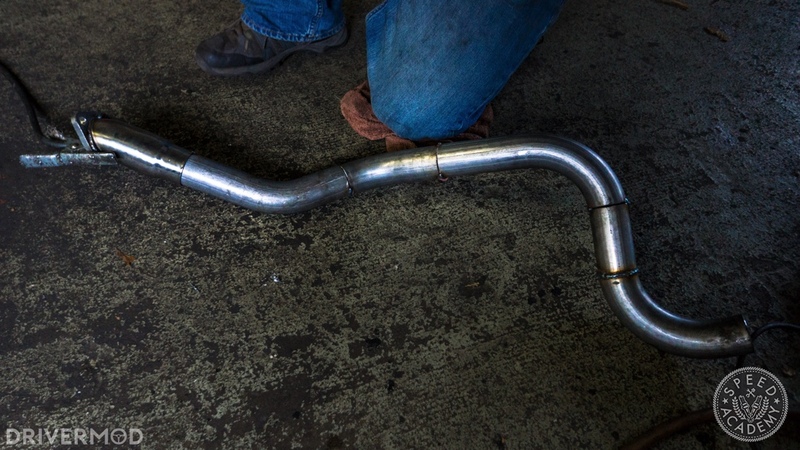 The last major hurdle standing between you and your Ecotec Miata is fabricating your custom exhaust. 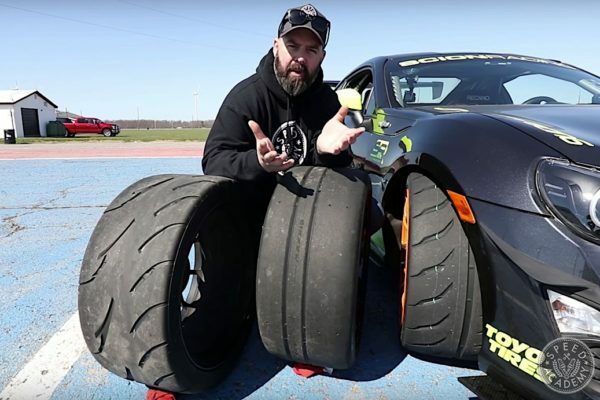 It’s the least bolt-on and arguably most difficult part of the swap, so if you’re new with exhaust work, it’s highly advisable for you to get professional help with this part. 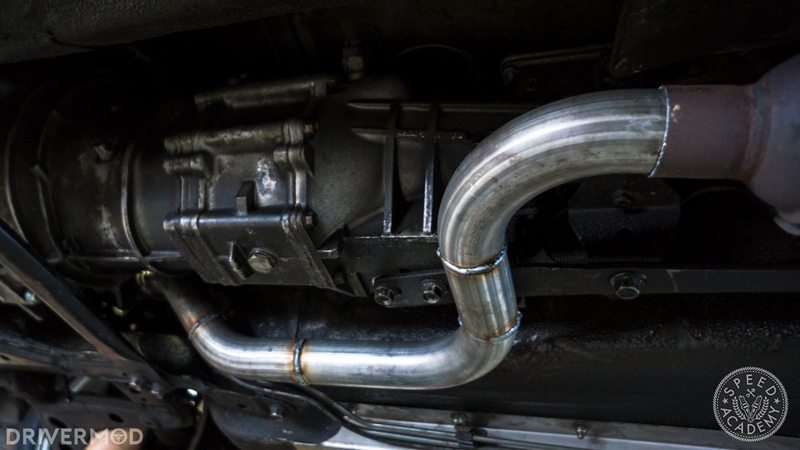 What makes the exhaust tricky, is that you’ve moved the header from the driver’s side to the passenger’s side of the car. 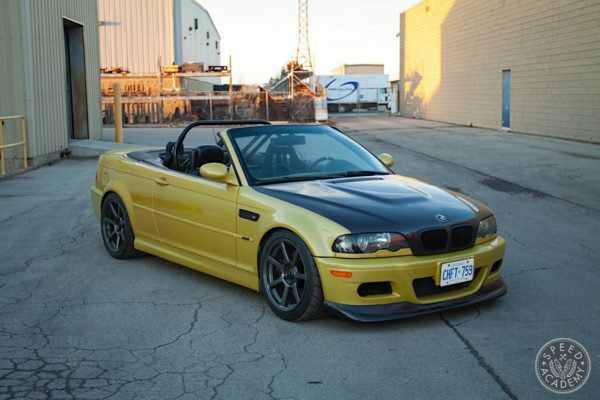 That means you’ll need to make some room between the subframe and the body by relocating the clutch line. 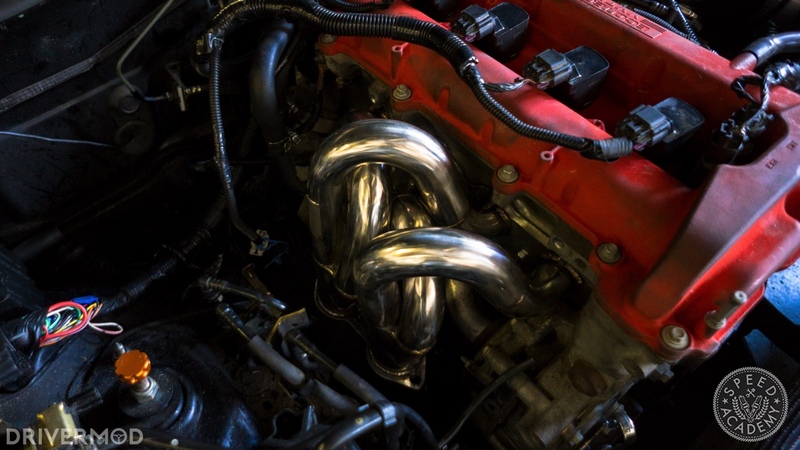 Before we get to that, let’s talk headers. There’s a bunch of different options you’ll have – really any Ecotec header can be used with enough modification. 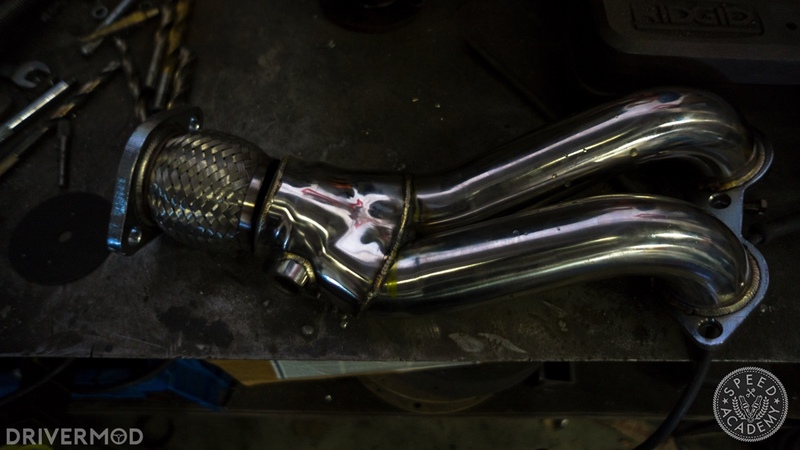 Headers designed for rear-wheel drive Ecotecs (Pontiac Solstice/Saturn Sky) are probably the easiest option. 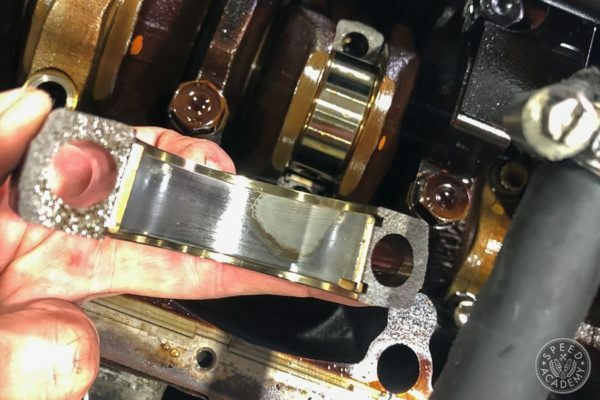 MT Motorsport, the shop that created the Ecotec Miata swap kit, has been using modified long tube headers designed for the Chevy Caviler on most of their swaps, so that’s what we elected to do. Here’s the one in question. Here’s where things get tricky. The header needs to be cut and re-welded so that the pipes bend off to the side, instead of straight back the way they would on a FWD car. The drawback of this design is that your header is no longer equal length. The shorter section of pipe is simply cut shorter and re-welded between the flange and the collector, while the longer section needs a slight extension. If none of this makes sense, check out the picture above. Note: it’s not completely welded yet (hence the gaps), and we haven’t welded a flange onto the end of the collector yet either. With this design, the flange should point towards the gap between the subframe and the body. 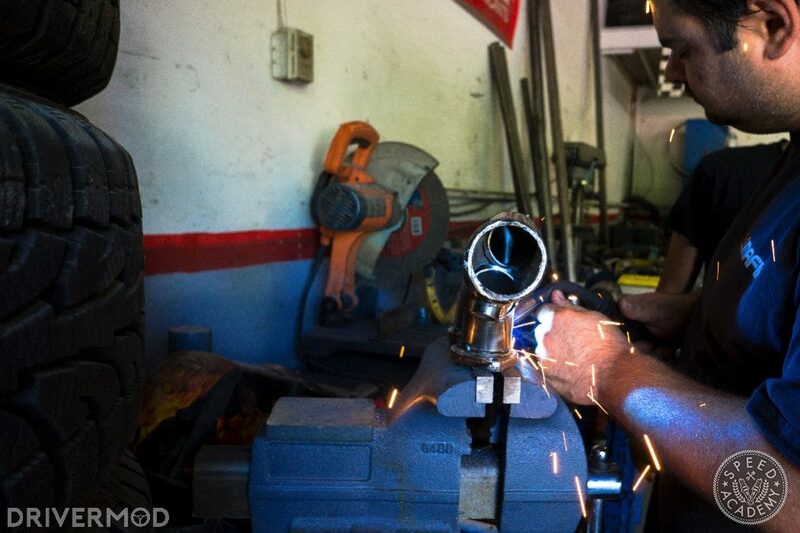 It’ll probably take a few tries for you to get it right, so make sure you tack-weld everything and test fit it before you weld it up completely. 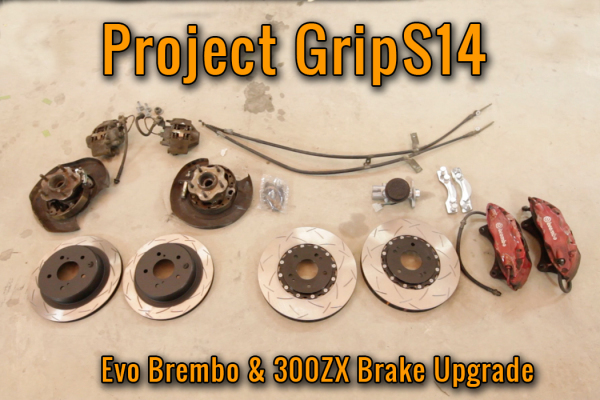 With your header finished, next, you’ll have to redo your clutch line. The problem is that, for whatever reason, your clutch line has a coil in it that will get in your way when you run a pipe through that gap. 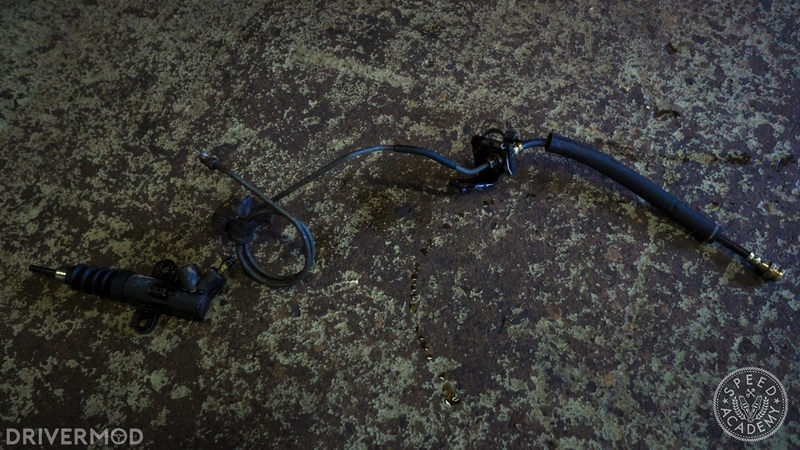 First, drain your clutch fluid from your clutch fluid reservoir; a turkey baster is a cheap way to do this. Next, you’ll need to unbolt the soft rubber clutch line from the hard clutch line found against the firewall on the passenger side. Fluid will leak out when you do this, so be ready to catch it with a rag or container. Next, remove the two bolts holding the master cylinder onto your transmission, and pull the whole assembly out of the car. 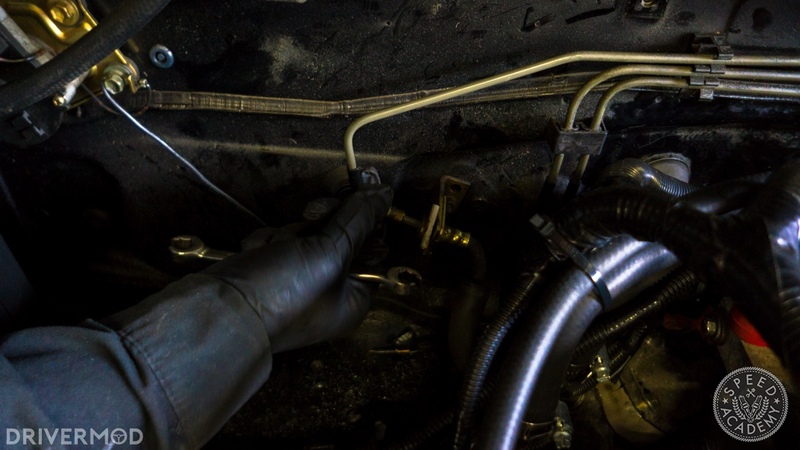 Unscrew the hard line from the master cylinder and from the soft line. 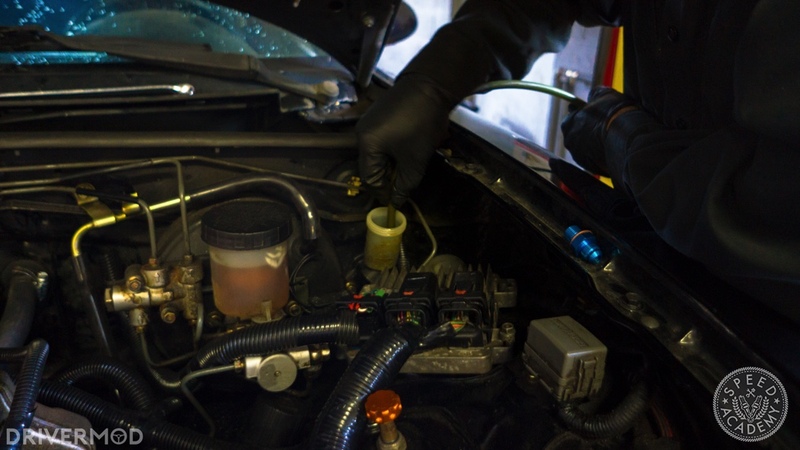 In the picture above, we’ve removed the hard line from the master cylinder. This hard line is getting thrown away, and you’ll either need to make yourself a new straight hardline, or there’s a bunch of retailers that sell them ready for installation, like this one. Install the new straight hardline on the master cylinder and the factory rubber line, and you can reinstall everything. Then, you’ll need to refill your clutch fluid and bleed the system. 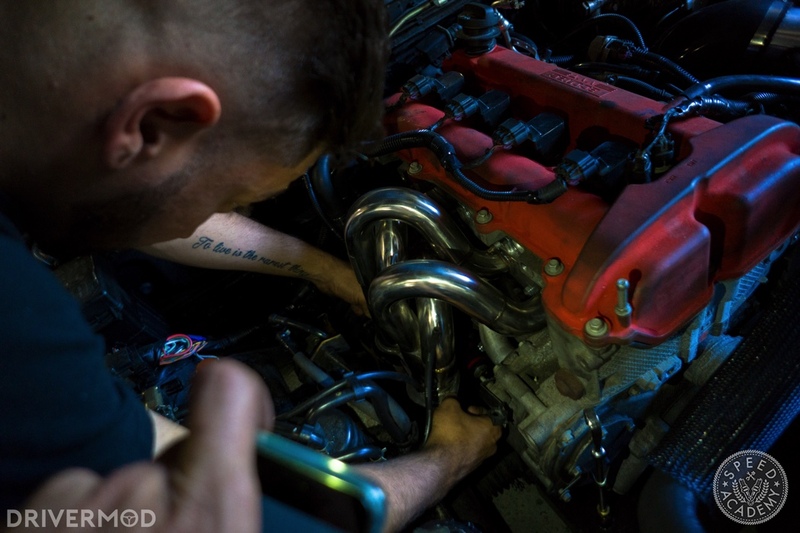 With the clutch line taken care of, it’s time to install your finished header and get the car up on a hoist to finish the exhaust. 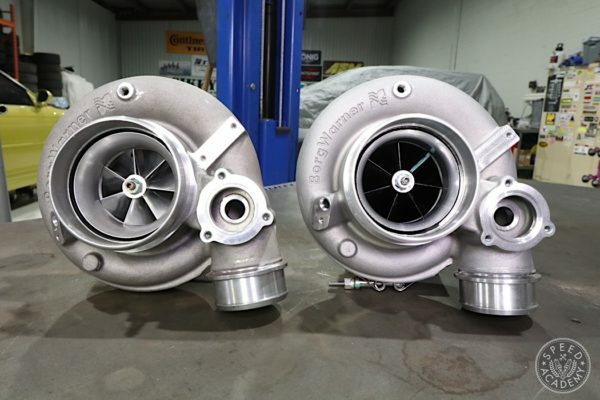 This is where it gets really tricky, because there’s almost no room between the trans and the body, and you do not want to hear it vibrating constantly once your swap is finally complete. Getting a pipe through here requires two pieces; you have one that bends downward into the gap. You can see that tack-welded above. 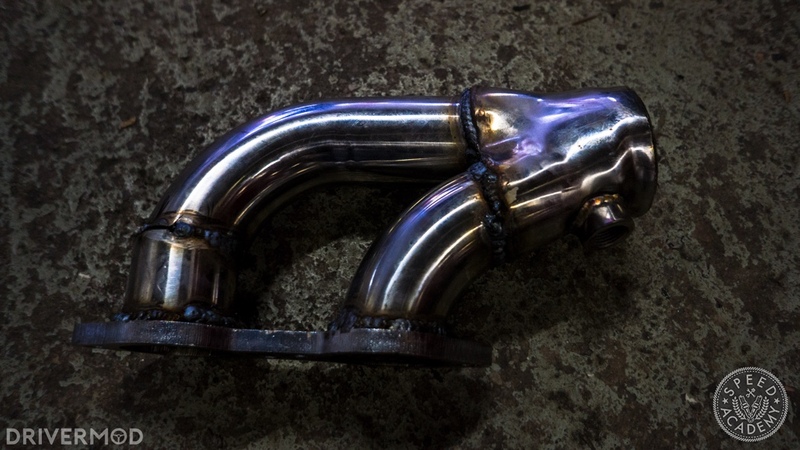 Then, another bend is welded onto that piece, followed by a straight pipe running parallel with the floor back to the rest of your exhaust. We ended up reusing the factory Miata exhaust. 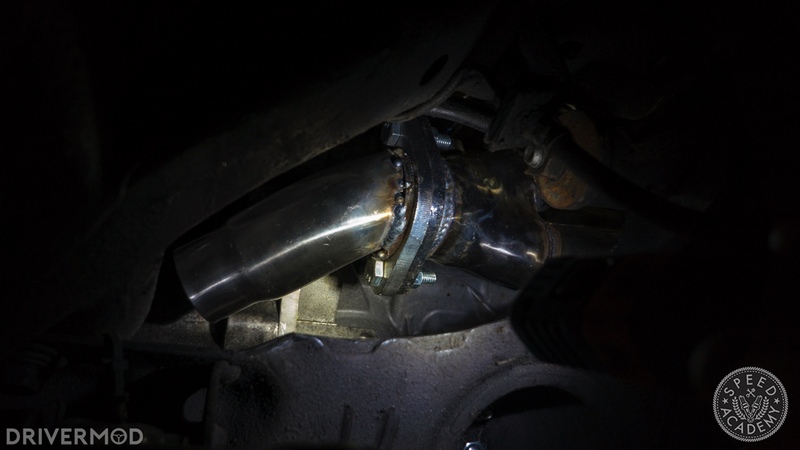 This meant cutting the factory exhaust just after the catalytic converter and welding two bends into our downpipe so that it travels from the passenger side, across the driveshaft, over to the driver’s side of the car. Above is a picture of the downpipe tacked together. 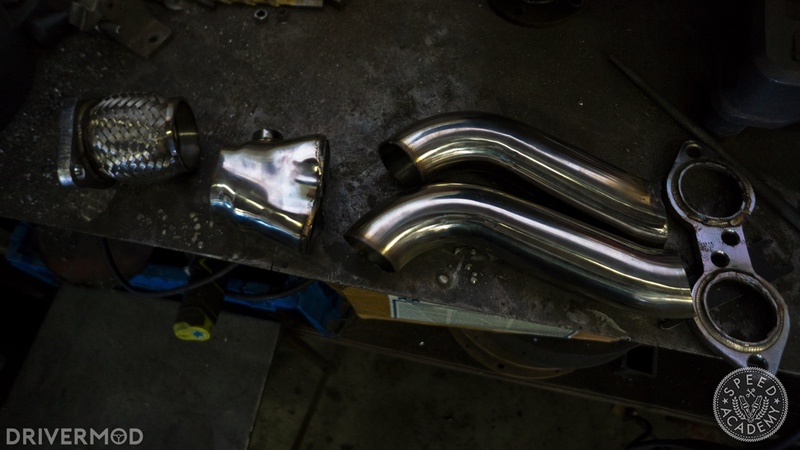 After test fitting the exhaust to ensure fitment, it was fully welded together and bolted up to the header. At this point, all we had to do was weld it to what was left of the factory Miata exhaust and, voila, you have an exhaust system. Next, we’ll take care of fuel lines, vacuum lines, and get the car running.